Egypt has sent a shipment of medical aid to “the brothers of South Sudan” through the Egyptian Agency for Partnership and Development (EAPD), the Egyptian foreign ministry said on Sunday. The shipment, sent out on 5 October, has been received by the South Sudanese health ministry. The Egyptian foreign ministry said that the aid is a reflection of Egypt’s firm belief in the historical bonds and shared destiny of the two countries’ peoples. The statement also highlighted Egypt’s keenness on supporting the health sector in South Sudan as one of the sectors most vital for development in the fellow African country. 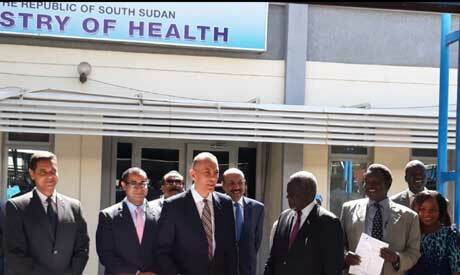 South Sudanese Health Minister Riek Gai Kok said that his country appreciates Egypt’s efforts in all sectors in his country, especially the health sector, as well as the role Egypt has played in supporting peace in South Sudan. Egypt says it will always exert efforts to help maintain safety and stability in the brotherly country, while reaffirming its commitment to offering assistance to development efforts in South Sudan. Last September, on the sidelines of the Forum on China-Africa Cooperation 2018, Egypt’s President Abdel-Fattah El-Sisi stressed to South Sudanese counterpart Salva Kiir Egypt’s support for the political roadmap drawn up in South Sudan last August. In August, Kiir and the head of the country’s main rebel group Riek Machar signed a final cease fire and power-sharing agreement. In 2011, South Sudan gained its independence from the Republic of the Sudan via referendum following several years of conflict, but civil war broke out two years later between the government led by Kiir and the rebel movement led by Machar.